Cold Tangerines---now available in softcover--- is a collection of stories that celebrate the extraordinary moments hidden in your everyday life. It is about God, and about life, and about the thousands of daily ways in which an awareness of God changes and infuses everything. It is about spiritual life, and about all the things that are called nonspiritual life that might be spiritual after all. It is the snapshots of a young woman making peace with herself and trying to craft a life that captures the energy and exuberance we all long for in the midst of the fear and regret and envy we all carry with us. It is both a voice of challenge and song of comfort, calling you upward to the best possible life, and giving you room to breathe, to rest, to break down, and break through. Cold Tangerines offers bright and varied glimpses of hope and redemption, in and among the heartbreak and boredom and broken glass. 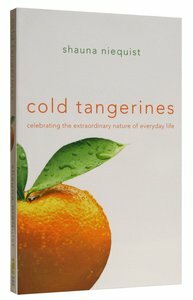 Customer Reviews For "Cold Tangerines"
Cold Tangerines is a biography of becoming and a story of celebration. I love reading this book as it has brought such joy to my life. Shauna has a talent with words that brings clarity to what it means to truly revel in the gift of life and find beautiful moments in the everyday.